This is a list of some nice people, which we met during our journey. We met this nice dutch couple in Palenque. They are heading to Bolivia or even more south. But the nice and slow way! Feb 18, 2010 - Durango Prov. Since quite a long time we are meeting cyclists again. This german couple is also on the road since nearly 2 years. From the southern dip of South America to North America. We together had at least a nice lunch beside of the road. Had a nice talk and exchanged the infos of the route, of course ;) Good luck to you for your last remaining months! The very first time we met in summer in nórthern British Columbia in Canada. He on his way north, we heading south. 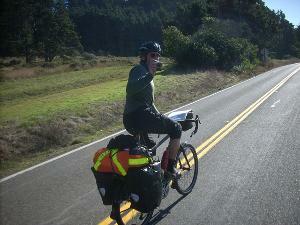 Months later we suddenly ´run into Doug along the famous Pacific Coast Route. He started initally in Montreal, cycled up north to Alaska and then south to southern USA. He plans cycling all the long way down to Argentina. 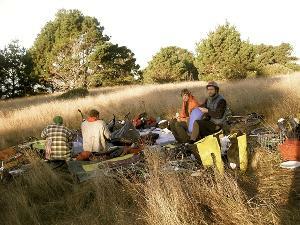 Together with Mark we have now a real Bicycle Camp every evening. Very nice! These 3 guys are young, ambitous and very interesting - met them several times along the pacific. Their goal is far away Argentina. Good luck, crazy guys! First met in Clinton, the along the Kelly Lake Road and finally on the road to Lillooet where unfortunately a spoke of Carmen"s bicycle broke. Therefore we cycled a little bit together and had then a very nice tenting above the Fraser River. 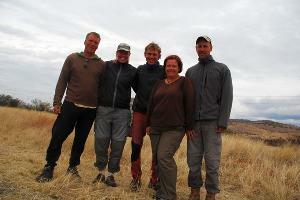 After a "coffee for breakfast" in Lillooet those three were leaving to go to Vancouver. It was very funny! Stephen is a bicycle enthusiasic, especially for old, classic bikes. He is currently planning his first real bicycle journey. 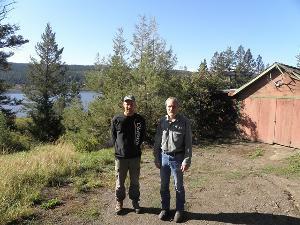 We met him at the laundry in Williams Lake, and had been invited for staying his house. It was a very nice and interesting evening! 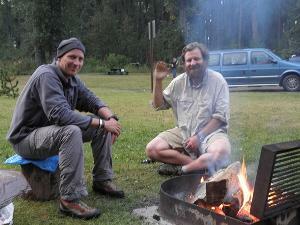 We spent some very nice and comfortbale evenings with warming fire on Smithers community campground. 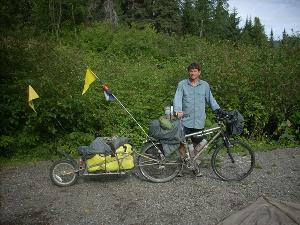 He is from Alaska and wants to cycle all the way down to Argentina. Was very to share a couple of beers together! First met during an awful rainy day, and then on the Meziadin Lake Provincial Park. 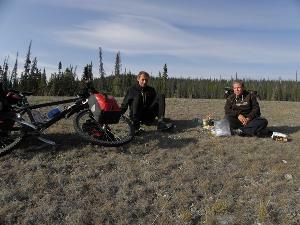 He is cycling from Colorado to far north Canada and back. Good luck for your last weeks on tour! First we met Thomas in Deconstruction Bay for a coffee (or two...). He then wanted to take a lift to Whitehorse because of his injured left knee. But the though guy cycled and pushed is bicycle further south. That fast that we camped together in the evening beside of the road. After a shorter ride we met again in Haines Junction! This very nice japanese cyclists we met several times. First in Anchorage before he was heading to Prudhoe Bay, then weeks later in Beaver Creek in Canada. 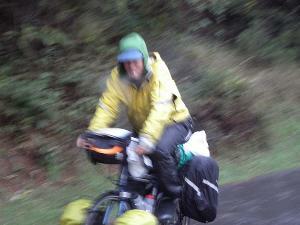 We cycled one day together, and hoped to meet him in Haines again. 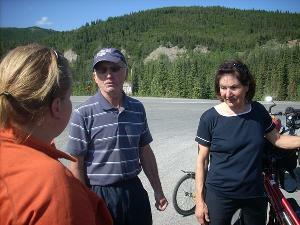 It worked, 2 days later he arrived at the wonderful hike&cyclist campground in Haines. These two funny brothers we met on the road to Tok. We camped together for free at a grocery yard, and in Tok behind a gas station - also for free ;) Had a couple of beers in famous Tok, and a lot of fun. 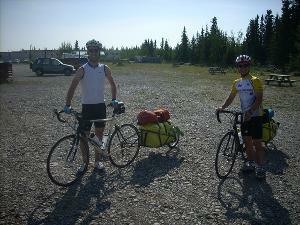 They are cycling for charity from Alaska to Panama. Keep on pedaling, and good luck for your great trip! 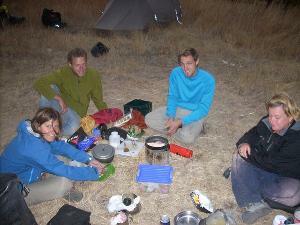 We met Holger right in time for camping in the evening beside a creek. We had a lot to talk and it was very nice. This is his very first biketrip and he enjoys it very much. He is prepared for bigger trips...;)) Take care, Holger, keep away from the bears! Extraordinary! 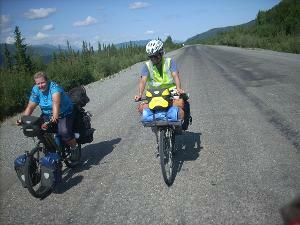 A retired couple cycles in Northern America. Also long and difficult sections. You have all our respect, keep on pedaling!! 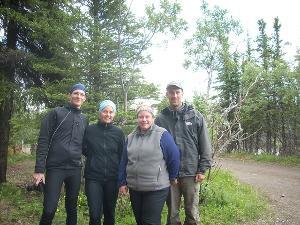 The Austrian couple we met twice in and at the Denali Nationalpark. 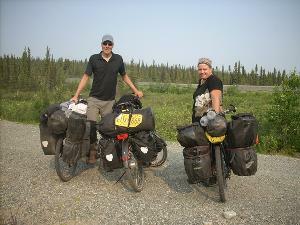 They are at the very beginning of a big bicycle journey, which should go to the southern end of Southern America. We wish you luck and good health on your trip!